With an increasing demand for using high tech devices, Barnes and Noble has come up with the latest and best looking Nook HD which supports android and almost top the competitive markets with its variety features. With a very high resolution screen and high tech features it comes with an attractive reading and provides different entertainments. It has a better rating than Kindle Fire, one of its main competitors. 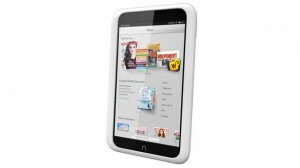 The Nook HD comes with a dual core TI processor of 1.3 GHz. The display is 7 inches with a high resolution of 1440X900 pixels and the ram is 1GB. There are two varieties of inbuilt memory- 8GB or 16GB. It also supports micro SD cards for additional storage. The Nook HD supports WI-Fi and has Bluetooth and it is very much attractive with an overall weight of 11.1 oz. And measuring 7.5X5X0.4 inch. It also comes in a different size of 9 inches with a processor of 1.5 GHz and 1920X1280 resolutions. But neither of these supports camera nor a HDMI port. But it can be easily purchased from outside. With a high speed processor the Nook HD provides no delay in opening a book or watching a video. It operates smoothly when applications are open. It offers a better screen than the Kindle whose resolution is 1280X800 pixels and an excellent graphic while displaying the contents of videos, photos, and other files. Since the launch of the first Nook, the new Nook HD offers more simple features and supports android 4.0. Each of the profiles comes with different contents, library, preferences and home screen. By removing the clutter the overall interface is improved. The previous versions displays multiple screens which made the person to get busy to surf through, but now with simpler looks and interface the handling of the device have become easy. A new and an interesting feature has been added to Nook HD that is the Scrapbook which helps one to navigate through the magazines by using just two fingers and also saves the precious newspaper clips. The web browsing using the Nook HD is very much fast and depends on the connection speed. The in-built browser is far faster than those of the previous versions and has attractive features like multiple browsing, adding the web pages directly to bookmarks, etc. A new feature that is ArticleView displays those pages of the web which contains posts in a reading way than normal pages. Again there is a small button at the bottom which on clicking makes the page URL as the subject and it can be send to any person. The overall configuration of the device is excellent and can be used without any doubts.